Once your account is set up by our team, you’ll have your own online dashboard where you can order the number of meals you’d like from our menu, tell us about any specific allergy requirements your children have. 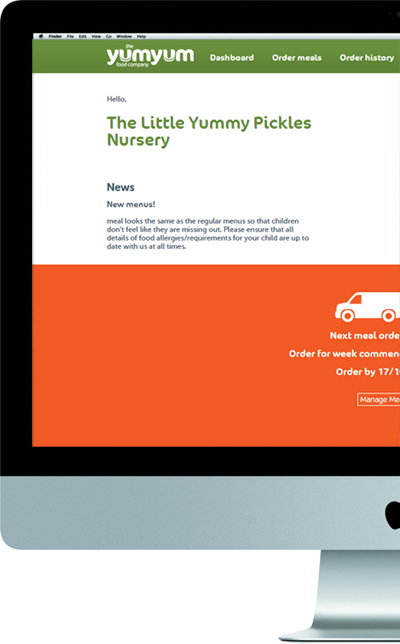 We also understand that planning is vital to a nursery’s daily operation so you can even order the meals for weeks or months at a time. Once you’ve ordered, you’ll receive confirmation of what you’ve ordered and when it will be delivered. We’ll also send you email reminders when it’s time to log in and order for following weeks. Yum Yums want to take the stress and effort of meal times out of your hands and provide you with a meal delivery service that is convenient, value for money and meets the current nutritional guidelines for children. If you would like to see how this would benefit your business, why not us now to discuss your nursery’s meal requirements?